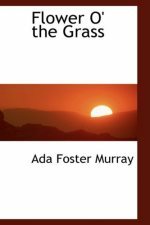 Born in 1856 in Virginia, Ada Foster Murray is perhaps best known as the mother of Aline Kline Murray but was also a competent and reasonably successful poet in her own right. Poems such as Prevision and Her Dwelling Place have been used in a number of anthologies over the years and she produced a few collections during her lifetime including Flowers O’ The Grass. Not much is known about her upbringing but she married a newspaper man, Kenton Murray and moved to Brunswick, New Jersey where her daughter Aline was born. Kenton Murray died in 1895 and she remarried just five years later to Henry Alden who was an editor with the magazine Harper’s. Ada Murray was affluent enough to afford her daughter a good education which meant that she could go to Columbia University in the early 1900s. There is no record of the education that Foster Murray herself had access to but she continued to write throughout her life, both poetry and prose. Murray published several poems in various newspapers and magazines during her lifetime, but it wasn’t until 1910 that she compiled and published a collection of her work under the title Flower’s O’ The Grass. The book included the works Her Dwelling Place and Unguarded. Unlike her daughter who grew up to earn a reputation as a serious poet and essayist, Murray wrote mainly about nature and had a rather overly romantic view of the world. Perhaps her most well-known poem is Prevision which uses the changing of the seasons to extol the renewal of the earth and the changing facets and challenges of everyday life. Like many of her contemporaries of the time, Murray brought religion, the natural world and human nature together in her poetry, producing something that was both romantic and, in many senses, was a world viewed through rose tinted glasses. Poems such as Her Dwelling Place are affirmations of Mother Nature whilst Unguarded could be considered a more accomplished and deeper work that explores a less optimistic subject matter. Ada Foster Murray, however, will always be known as the daughter of Aline Murray Kilner who wrote more substantial works such as Candles That Burn and Vigils. Murray herself died in 1939 at the age of 83.